City lawyer Assa Nyakundi, who is a suspect in the shooting of his son, was receiving visitors at one of Kenya's top hospitals for the fourth day on Thursday as initial results of an autopsy contradicted what he told police. Mr Nyakundi was still in his air-conditioned room on Ward LMF on the third floor of Nairobi Hospital, where patients have their rooms to themselves, receiving friends who came to inquire into his health. An armed police officer stood outside the room, but that was as far as being in custody went. The State has already passed the 24-hour period stipulated by the Constitution on how soon a suspect should be arraigned in court. Mr Nyakundi's lawyer, Mr Cliff Ombeta, insisted to the Nation that his client was still in custody. "Well he is still in their custody, though in hospital. As investigations go on, he remains a suspect," Mr Ombeta said. Initial results of an autopsy that was conducted on Wednesday on his son Joseph, 29, revealed that he was shot from the outside of the rear back of the car that he was in when the bullet that ended his life got him. The findings in the autopsy that was conducted by government pathologist Johansen Oduor contradict a statement that the lawyer recorded at Muthaiga Police Station that he accidentally shot his son using his Glock pistol. 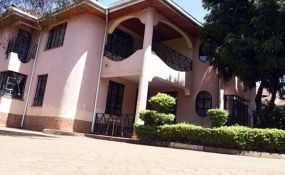 The postmortem further revealed that Joseph, who is the lawyer's second-born son, died due to "chest injuries and haemorrhage due to a gunshot that was shot at an angle of 90 degrees." "The shot projection from the chest exiting at the back suggested that the bullet was released from outside the car." This contradicts Mr Nyakundi's initial claim to the police that he only shot his son once accidentally and from the front seat of his car. On Thursday a detective privy to the matter told the Nation that they were trying to carry out tests to find out whether it was the right or left hand that was used in the murder. The source explained that if it was the right hand that was used, then Mr Nyakundi, who is right-handed, will have a case to answer. "The only way it can be accidental is if the tests prove that he used his left hand in the shooting," the source revealed. The source further said that it was already clear that the trigger was pulled, but what will be used to file a watertight case against the suspect was if it emerges that the incident was never accidental. "It is already clear that gun was in a single-action mode, which is always associated with the type of weapon in question. This is the key point of contention in the matter," the source said. On Friday, the investigators will be tasked with measuring the trigger pull of the gun, the force that requires the handgun's hammer to fall, and whether they are within the standards that are stipulated by the weapon's manufacturers. They will also further analyse the vehicle of registration number KCE 753B before the final report of the matter is released. On Monday, detectives stumbled upon 481 rounds of ammunition and two more guns in his house. One of the firearms recovered from the 60-year-old lawyer's house at Muthaiga Parkside Estate is a Sig Sauer pistol that was found in his master bedroom. And in a room adjacent to the master bedroom, which is used as a library, police found a shotgun.